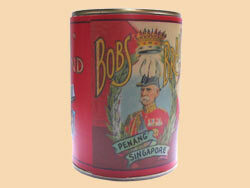 WW1 Reenactments Equipment : Great War Tommy WW1 Food Rations Labels : Bobs brand Singapore Pine Chunks, 1901. WW1 Reproductions and WW1 Reenactors Equipment / Kit - Bobs brand Singapore Pine Chunks, 1901. "Bobs" brand Singapore Pine Chunks, 1901. "Bobs" (Field Marshall, Lord Roberts of Kandahar, VC. affectionately known as "Bobs" to the rank and file of the British Army.) "Pine" Chunks (Pineapple) from Penang and Singapore of the Straits Settlements. Fits cans 4.5" x 3" diameter cans.